In early twentieth-century New York, few could have imagined a train terminal as grandiose as Pennsylvania Station. Yet, executives at the Pennsylvania Railroad secretly bought up land in Manhattan’s infamous Tenderloin District to build one of the world’s most spectacular monuments. Sandhogs would battle the fiercest of nature to build tunnels linking Manhattan to New Jersey and Long Island. For decades, Penn Station was a center of elegance and pride. But the ensuing rise of the airplane and automobile began to diminish train travel. Consequently, in the mid-1960s, the station was tragically destroyed. The loss inspired the birth of preservation laws in the city and the nation that would save other landmarks like Grand Central. 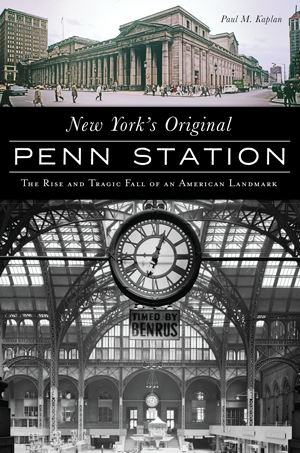 Author Paul Kaplan recounts the trials and triumphs of New York’s Penn Station. Paul Kaplan writes critically acclaimed books in three series: Cultural Guides (Jewish New York: A History and Guide to Neighborhoods, Synagogues, & Eateries and a sequel for Jewish South Florida), Social History and Biography (Lillian Wald: America’s Great Social and Healthcare Reformer and a children’s book on Irving Berlin) and Business Marketing (Content Marketing for Success: Build Your Brand and Generate Leads). He has been featured on numerous radio shows, including Woodstock Booktalk, America’s Dining & Travel, Let’s Travel Radio and Writer’s Voice. His books have been on PBS-WNET and CBS Miami. He’s been featured in several newspapers and magazines, including the New York Press, Princeton Magazine, Amsterdam New York and Reminisce magazine. He gives book tours to numerous organizations at venues throughout the United States. Kaplan earned a BA in ethics, politics and economics from Yale College and an MBA from the Yale School of Management. Kaplan maintains a career as a marketing director for the publishing, technology, educational and financial industries. His website is paulkaplanauthor.com.